Whether you live in a small house and need to maximise storage, or have simply accumulated a lot of stuff over time, a bed with a handy storage solution is a great option for keeping your bedroom tidy and clutter free. When it comes to choosing the best bed with storage, you should think about how this new piece of bedroom furniture is going to fit in with the design of your bedroom. 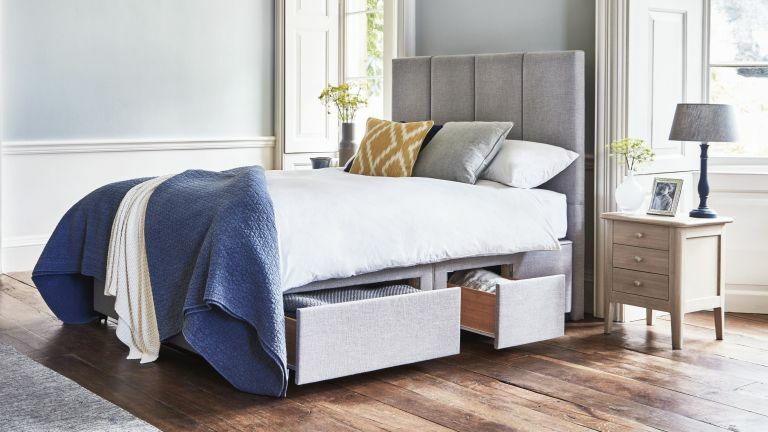 From classic wood options that are perfect for traditional bedrooms, to stylish suede (or faux suede) options, you're sure to find a design that suits your style as we guide you through choosing a bed that maximises storage potential. Before you go thinking that storage beds have to be really cumbersome, and while practical, not the most stylish of beds, can you please just look at this offering from Made.com? It was the lovely curved headboard and dark grey piping and button back of the Burcot storage bed that got us. But, of course, it's not all about looks, its sprung base also flips up to reveal ample storage, ideal for spare bedding or stashing away clothes. With a simple, yet contemporary design, this quality upholstered bed from Wayfair is undeniably stylish, while offering a practical storage solution. Handy under-bed storage is perfect for storing out-of-season clothing or spare bedding, meaning it's never been easier to stay organised. The use of linen over a solid wood bed frame ensures a high-quality finish that has the added benefit of adding a luxurious feel to the bedroom. With an unfitted and distinctly rustic feel, we love the finish of the Bronx Bed from Next and think it would fit in perfectly to a boho-inspired home. In addition to making an understated design impact, we love the fact that this bed provides plenty of under-bed storage, with two large and sturdy drawers designed to meet all of your storage needs. Available in a range of sizes, from a Small Double up to a Super King, this handy bed can suit any space, no matter its size. If it's a dramatic focal point (in addition to plenty of storage) that you're looking for, this popular Chesterfield-esque frame fits the bill. A large, plush headboard adds to the sophisticated feel of a space, while also serving as a comfortable spot to unwind after a long day. While we'll admit that the Rouen doesn't offer as much storage as some of the other options, it's the perfect meeting of style and practicality with two large drawers positioned neatly beneath the mattress. A stylish, wool blend bed with hidden storage. What's not to love? We love the contemporary finish of this grey, wool-blend bed and the fact that its storage remains a concealed aspect of its design. Due to its mattress sitting relatively high, there's not only space for two, built-in drawers, but some additional, under-bed storage. Simple and understated in style, the Tempur Bayonne Ottoman Bed from John Lewis is perfect for spaces with limited storage (and space). Opening up to reveal a generous area inside of the bed, it's perfect for storing spare bed linen, winter duvets and small suitcases. Its plush, cushioned headboard helps ensure comfort is at the forefront of its design, providing the perfect starting point for building a cosy and luxurious sleep set up.